One of the biggest advancements in running shoes this century has been by Adidas with their Boost midsole material. Hyperbolic? The century is young, I challenge you to come up with something that has been as revolutionary as Adidas with their Boost foam. Boost is a thermoplastic polyurethane (TPU) foam that Adidas developed in conjunction with BASF. TPU is becoming more prevalent with Saucony incorporating TPU in some of their shoes and now Brooks has at least one shoe with TPU in the midsole. Adidas still leads the race in the both the amount of TPU used in shoes and the number of different shoes using TPU. Since several companies are now using TPU it’s a good time to see if TPU and in this case Adidas Boost foam is worth a run. I reviewed the Adidas SuperNova earlier this year and the SuperNova ST is the stability version of that shoe. 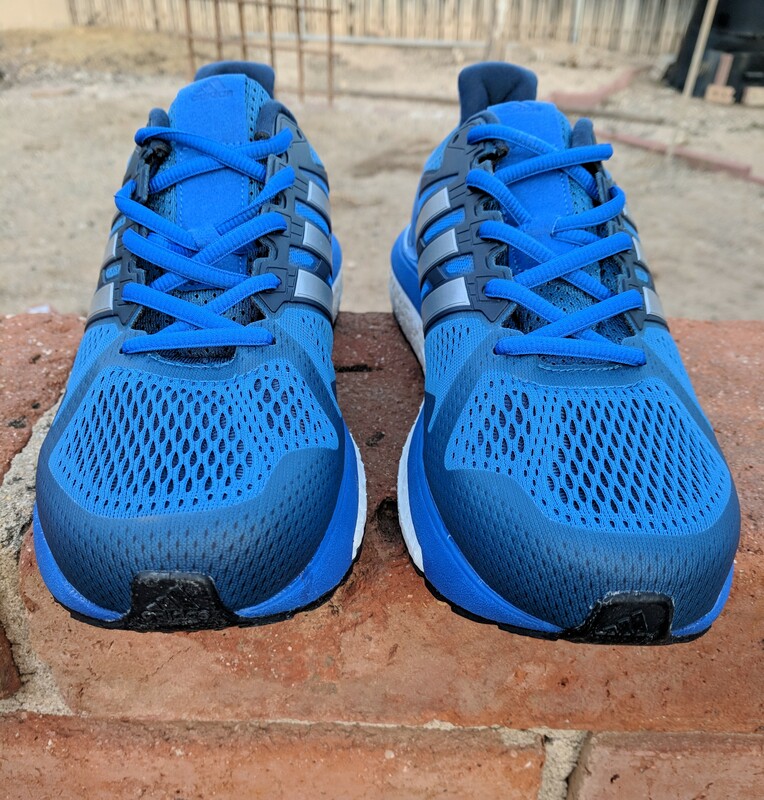 I’ve been running in the Adidas Supernova ST now for several weeks. This is the shoe that replaces the Adidas Sequence 9. This may cause some confusion since the Sequence suffers from a name change. Some Adidas catalogs had it listed as the Sequence 10 while others had it listed as the SuperNova ST. It seems that Adidas is floundering a bit in with their run specialty line. Yet that has not stopped them from taking market share and seeing significant growth through Q3 2017, at least in the US. Q3 & Q4 of 2018 should provide us some clues as to which direction Adidas is running. 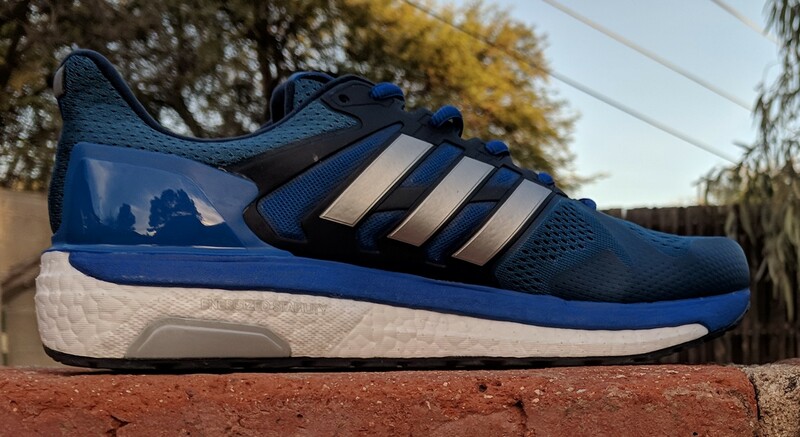 The SuperNova ST is a stability shoe using an 80% Boost midsole/20% EVA midsole material with a filament covered Boost wedge for medial posting. When you combine this with the plastic Torsion System and a wide outsole you get a shoe that provides a stable platform and moderate yet solid medial control. The shoe has almost 30mm of cushioning under the heel yet it’s an 8mm drop shoe. It’s a bit bulky, weighing in a 11.1 ounces (310gms) which is heavier then it’s predecessor and many other moderate to high moderate stability shoes. The upper is an engineered mesh upper with firmer urethane bonding material over the toebox and forefoot of the shoes. The midfoot is wrapped in firm plastic frame that is anchored under the plastic heel counter and at the footbed. There is a tab at the heel that leans away from the Achilles. If you have narrow feet you may not like the upper changes as it’s more accommodating than in the past. For my wider than normal feet this shoe is awesome. The fit and sizing are spot on with adequate length and volume to accommodate my long toes and high volume feet. I even found myself tightening the lower laces after a few runs. The shoe has an extremely durable Continental rubber outsole. Given that TPU midsoles rebound better than EVA midsoles this outsole/midsole combo should allow you to get more miles then you’d normally get out of a pair of shoes. It wouldn’t surprise me if you ran well over 600 miles on these shoes before they were toast. While all the above is well and good it means nothing if the shoe runs like a brick. The SuperNova’s ST are no brick. 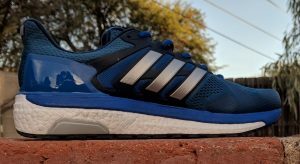 I enjoy running in my Adidas Supernova ST’s for a variety of reasons. They provide a plush run. The Boost material is firm without being hard and soft without feeling squishy. They fit my feet well, which isn’t always easy. Comfortable, able to handle long miles with ease and yet are more responsive than many daily 11oz training shoes. It’s just a shoe that is day in and day out run comfortable without thinking about it even if you go longer than planned. I’ve experienced no hot spots or blisters wearing a variety of socks from ultra-thin to medium thick socks. The outsole provides excellent traction across a variety of surfaces from packed dirt to wet asphalt and concrete sidewalks. All in all Adidas has proven, again, why they have been gaining market share in the specialty running shoe category. If you’ve not tried a TPU midsole shoe, the SuperNova ST’s or any other Adidas Boost running shoe is definitely worth a test run. I’d like to thank The Running Shop. Without their continued support these reviews often wouldn’t be possible. If you’re ever visiting Tucson, stop in and let the staff help you find your perfect pair of running shoes.